Has every person who has ever lived had a chance to know God? Listen to this lesson to hear that all people inherently know there is a God and that God’s creation is proof of it. See that God has set up a nonverbal testimony of His existence. Understand the difference between general and special revelation. Realize that those without the capacity to understand the gospel will be saved. Find out there are no second chances to believe after death and learn about Hades from the story of Lazarus and the rich man. Be motivated to share the gospel with unbelievers when possible. What does it mean when the Bible says that everyone must give an account of themselves to God? Listen to this lesson to see that every person born into this world will face an evaluation by God. For the believer this is called the Judgment Seat of Christ where we will be evaluated in order to determine our rewards and responsibilities. For the unbeliever, there is the Great White Throne of God. Hear what aspects of a person’s life will be judged there to see whether or not they are qualified to live with God forever. Hear about the Lamb’s Book of Life and the Book of Works. Understand that sinful man cannot perform righteous deeds. Realize that the Lake of Fire is a reality. When talking to unbelievers help them to see that sin is no longer an issue since Christ cancelled the sin debt on the Cross but the focus is on belief in Christ. This lesson also includes Revelation 20:11–15. Are you ready to think about something that can change your life? Listen to this lesson to learn what the Bible says about how everyone of us, believer and unbeliever, will stand before God one day and give an account of our time on earth. Find out that there are nine judgments mentioned in the Bible and that Jesus Christ, who became a man and lived on earth, will be the judge. See what takes place at the Bema Seat of Christ and learn that this judgment is for believers only to determine their rewards. Find out that the issue at the Judgment Seat of Christ is how faithful a believer was. Accept the challenge of living each day in the light of eternity so you will receive the promised rewards. Are you living your life like a foolish person or a wise person? 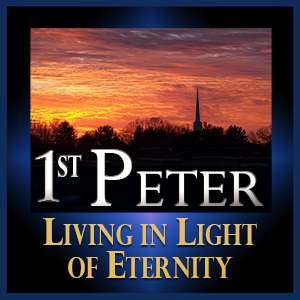 Listen to this lesson to learn what Peter is saying to new believers as he describes the Christian lifestyle as compared to their former ways of debauchery and reckless living. Understand the contrast between being drunk with wine and walking by means of the Holy Spirit. See how he warned them to expect to be ridiculed, falsely accused, and persecuted by those who don’t believe in Christianity. Understand that while it may not seem fair or just they are not to worry or seek revenge. God will hold everyone accountable and judge them someday. Once we’re Christians sin isn’t much of a problem, right? Wrong! Listen to this message to hear about the sins that Christians face that war against their souls. See that when we succumb to those sins we develop “black holes” in our soul that destroy our stability and contentment. Hear about the six sins that Peter describes which are caused by our own lusts and corrupt our thinking and distort our values. Find out that the solution to these sins is confession, studying the Word of God, and walking by means of the Spirit. What does it mean when the Bible says that believers are to be a “distinct people”? Listen to this lesson to learn that it’s our thinking that needs to be different from those around us. See that when we study the Word of God and walk by means of the Holy Spirit our thinking is transformed from human viewpoint to divine viewpoint. Find out what Peter means when he refers to the Gentiles. See the importance of not being influenced by the “spirit of the age”. Hear a report on the missionary work that took place in Brazil last fall when Jeff Phipps and Ray Mondragon went there. Do you realize you have to “get over yourself” if you want to lead a spiritual life that gives you happiness on this earth and rewards in eternity? Listen to this lesson to learn that all of us have a sin nature that causes us to be self-absorbed and self-indulgent. Also, we are surrounded by demonic thinking which feeds our lust patterns. See that the answer lies in immersing ourselves in the Word of God as we walk by means of the Holy Spirit. Hear nine points on how we can grow spiritually and become mentally tough and ready to face the challenges that come our way. Did you know that what goes on between your ears is what shapes your life? Listen to this lesson to learn that you are fighting mental battles daily. See that your sin nature or human viewpoint is warring against God’s revelation in His Word which is Divine viewpoint. Learn about eight lust patterns that want to run amok in your soul and find out what God has designed for Christians to counter them through means of the Holy Spirit. Realize that the solution is always focusing on our mental attitudes and using our volition to choose to walk with God. If your life needs to change, your thinking needs to be changed. Listen to this lesson to hear the truth that will open your eyes and change your life. Find out that having the right mental attitude is of supreme importance. Learn that it is by studying the Word of God and walking by means of the Spirit that we learn the standard of God’s thinking called Divine viewpoint. See that Jesus Christ is our example and it is by arming ourselves with Scriptures that we are trained and begin thinking about the things God wants us to think about. Understand that we are to demonstrate in our lives that God’s viewpoint is right and resolve that we are no longer going to handle our problems by sinful thoughts and actions.